This Christmas 2011 in Foligno the appointment with the Christmas Market in the city center will be renewed. So what are you waiting for? Come and visit this beautiful Umbrian city! 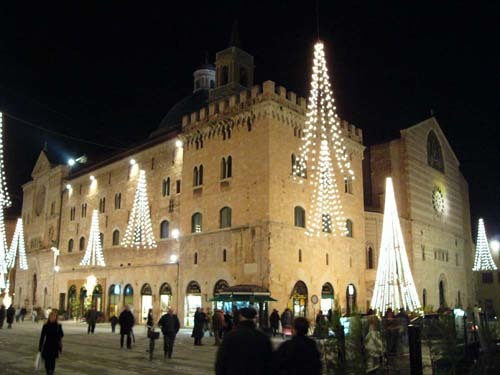 You will find the Christmas markets of Foligno, and events related to the ongoing Christmas holidays in Foligno. The Christmas markets have become a tradition in Foligno. The city is transformed during the Christmas period: small squares reveal unexpected lighting effects, Christmas music inundates the streets, Christmas choirs, the little market of dreams, music bands, and happy bands are the usual appointments of this time of the year. The various events and happenings are aimed at livening up the historic center, focusing on its vitality, including shops and other commercial activities, while leaving behind other initiatives such as streets parties and celebrations for New Year's Eve. Moreover, the attention that is reserved to children has been emphasized with many initiatives dedicated to them, and it must be said that the new featured activities are quite many. The city of Foligno is located at the heart of the Umbrian Valley, a vast plain crossed by the river Topino, partly surrounded by rolling hills and partly by the highest mountains of the Apennines. The town has always been a center of economic and cultural exchanges. Foligno is now a modern industrial city, but still retains a beautiful old town center full of monuments and works of art. The heart of the city is represented by the Piazza della Repubblica, where buildings are of high artistic value.